Have you ever wanted to make your own deer lure? This DVD will show you the simple secrets to making your own deer lure and help you create a lure that is more effective than anything you can buy off the shelf. 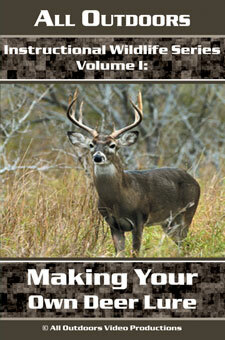 With this DVD, you will learn two different lure formulas and a cover scent to use the next time you go into the field. Russ Carman Trophy Deer Lure is exactly what the title states, a trophy deer lure. Sure to attract trophy deer, works on both bucks and does.